Is The STARQUEEN SQ-F19 Portable Bluetooth PA System Good For Parties? 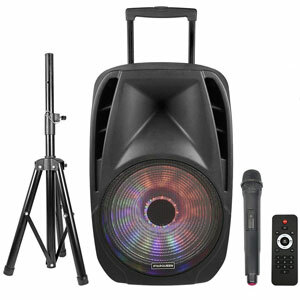 A good PA system is essential for back-yard parties, and the STARQUEEN SQ-F19 Portable Bluetooth PA System aims to offer everything that buyers will need in one package. The most important specs on this speaker are the 15’’ woofer, multiple inputs, rechargeable battery and portable design. The PA kit also comes with a microphone, tripod and remote. Less important features include the colourful lights and “mic priority” setting. There is lot for new users to explore, but are they happy with the performance?